South Africa captain John Smit refused to get carried away with his side's 44-31 Tri-Nations victory over Australia and accepts his side still have plenty to work on. The Springboks ended a run of four defeats to clinch a first win in the competition and while Smit was relieved to have finally turned the corner he conceded it will be difficult to defend the World Cup next year on the same form. "The second half was a little bit closer to what we want," he said. "But after the start we had, we know we definitely need to tighten up - that really complicated matters. We wanted a lot more accuracy and it came after the first 15 minutes, but that is not the type of rugby that will win you the World Cup. We want to show patience and play on our own terms." The start he was referring to was the Wallabies snatching a 14-0 lead inside the first five minutes and then retaining that margin after 10 minutes. It was a dreadful start and one that Smit was not proud of, but he felt happy with the spirit shown by his players. "Coming back from being 14-0 down and the game had barely started is something we can be proud of, but it's obviously not something we wanted to do," he said. "I told the guys that we still had 70 minutes left and there was plenty of time to win this game, and we started to do things better. "We held on to the ball more, kept it in hand and got the set-pieces working. In the four weeks since we got back (from Australia and New Zealand), we worked on correcting the errors that had crept into our game and got back to basics." 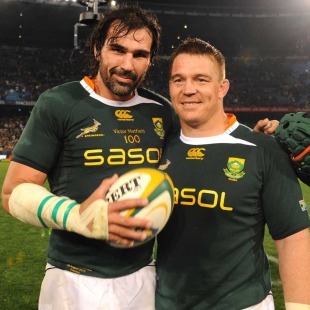 Smit, who saw his 100th cap spoiled by the All Blacks seven days earlier when the Springboks were beaten in Johannesburg, also heaped praise on his deputy Victor Matfield after he marked his own century appearance with a win. "It's a huge testimony to the type of guy Victor is - he didn't make a big thing about it and the only time we would have known it is an occasion was when we saw the 100 on his jersey," he added. "We didn't say we wanted to do it for Victor, but rather that we do it for each other, so that Victor could have a celebration tonight." Australia skipper Rocky Elsom, who said in the build-up that he expected the hosts to start with a bang, was left surprised by the proceedings at Loftus Versfeld. "Although we got off to a flier, the Boks retaliated just as fast," he said. "It ended up being a fast game for the full 80 (minutes)." And the Waratahs flanker felt they lost the game in the second half when the visitors scored only three points to the 20 by the world champions. "We took our chance early on, but just came up short in the end. In the second half we did not retain possession enough to win. We needed to hold onto the ball at the end, and we didn't do that."